We have been developing new methods of studying cirrus, making it possible to do light scattering measurements in the laboratory, instead of having to take complex equipment into high-altitude clouds. The methods depend on two new analogues: fine glass fibres with hexagonal cross-section and crystals with shape, size and optical properties closely resembling those of atmospheric ice. Unlike ice these materials exist at room temperature and do not change their shape and size under normal conditions, which makes them much easier to studying than ice. The hexagonal fibres are made by grinding and polishing optical glass into the shape of thin hexagonal rods and then drawing the rods out at high temperature. Unfortunately the procedure is quite lengthy and laborious if high precision is required. This is certainly the case for the purpose for which the fibres are intended, namely the testing of theoretical models of scattering - see Publications for further details. Our crystalline analogues are based on fluorosilicates which, like ice, have unusually low refractive index of about 1.31. And like ice the crystals have hexagonal symmetry. They can be grown from aqueous solution using fairly straightforward methods - see Publications. We have produced a variety of ice analogue crystals including simple shapes such as hexagonal columns or plates and more complex ones such as rosettes and aggregates. The crystal habit and size are influenced by the growth conditions - we can obtain predominantly one form of crystal, for example column. On the other hand it is beneficial to encourage crystal shape diversity, so that the huge variety of crystal forms found in cirrus clouds can be represented. In common with cirrus ice, complex ice-analogue crystals often have 3-dimensional spatial structure. A stereo view of a rosette is shown here. 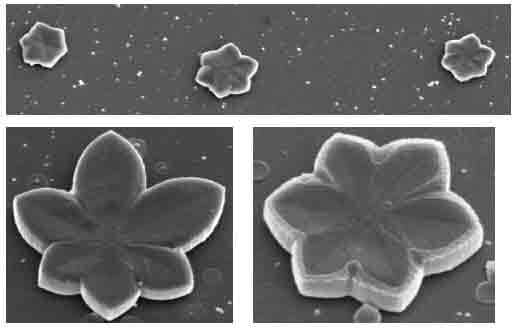 Individual crystals can be isolated from mixed samples using micromanipulation methods and their scattering properties measured in the electrodynamic trap. 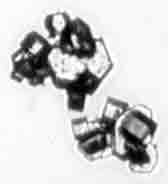 See a list of images of Simple crystals. 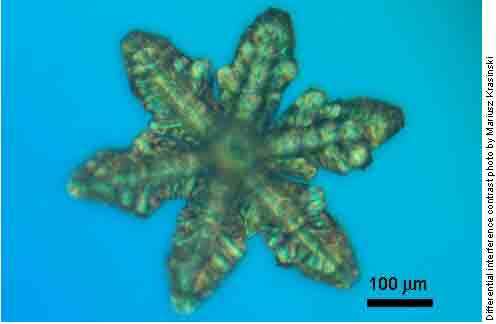 See a list of images of Complex crystals. The crystal images shown on this page have been produced using a scanning electron microscope, so that precise details of crystal morphology could be seen. 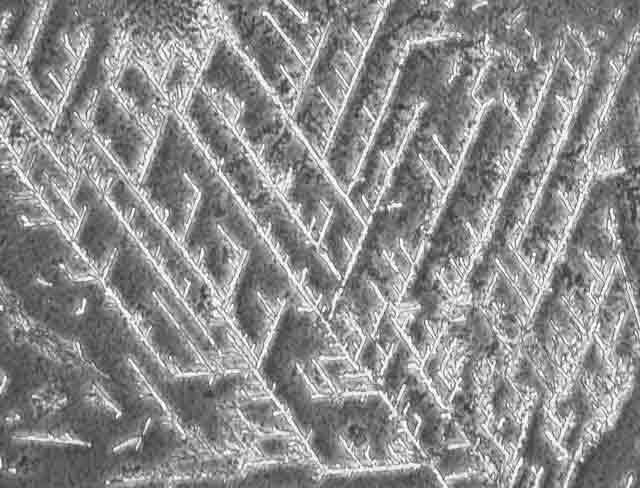 However, optical images are more familiar to those who study ice crystals, since SEM images of real ice are difficult to obtain, unlike for the analogues. So for comparison we include the picture on the right which was produced using an optical microscope and shows some ice-analogue aggregates, each with a maximum dimension of about 200 micrometers. Hollow ice-analogue crystals, photographed under an optical microscope using phase contrast, are shown below. Ice crystals are perhaps best known in their dendritic form - as snowflakes. 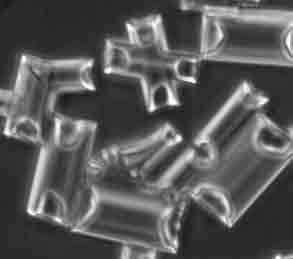 Large, snowflake-like crystals are not usually found in cirrus clouds. More common are hexagonal plates and to a lesser extent star-shaped crystals, which can be thought of as an intermediate form between hexagonal plates and dendritic crystals. We have found that under certain growth conditions such stellar crystals are predominantly produced. 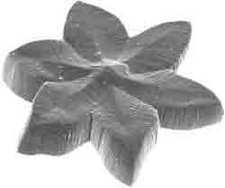 Sometimes they assume flower-like forms, as in the examples shown here. Two examples of dendritic ice-analogue crystals are shown above and below. See also analogue crystal halos and levitated analogues.